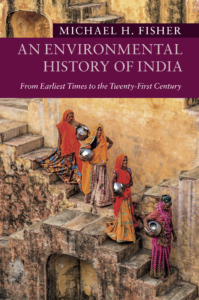 AIIS congratulates Michael H. Fisher on the publication of his sweeping new anthology, An Environmental History of India: From Earliest Times to the Twenty-First Century (Cambridge University Press). Prof. Fisher writes below on the challenges and rewards of synthesizing years of research within a single book, and on the role played by AIIS in facilitating such work. By supporting scholars internationally and bringing them into conversation and collaboration, AIIS makes possible significant research projects, including about India’s long environmental history. My most recent book, An Environmental History of India: From Earliest Times to the Twenty-First Century, in the Cambridge University Press series New Approaches to Asian History, builds on and synthesizes the exciting scholarship of many AIIS fellows and officers. During my AIIS Senior Research Fellowships (1991, 2002), I concentrated on other book projects (respectively The Travels of Dean Mahomet: An Eighteenth Century Journey through India [Berkeley: University of California Press, 1997] and Counterflows to Colonialism: Indian Travellers and Settlers in Britain, 1600-1857 [Delhi: Permanent Black, 2004]), but I also read the work of, and met with, scholars in the emerging field of Indian environmental history. Then as a member of the AIIS Selection Committee (2008-11), Vice President (2009-10), and member of the Board of Trustees (2015-18), I was deeply engaged with the latest research—proposed, in process, presented at AIIS-sponsored panels, and published—about this rapidly developing field. Such a sweeping and interdisciplinary study as An Environmental History of India would not have been possible without my involvement with AIIS. Tracing the environmental history of the Indian subcontinent from continental drift to the twenty-first century, while displaying deep historical processes, necessarily involved careful selection of major trends and themes. Among other disciplines, archaeology, anthropology, and genetic analysis all provide vital interpretations of non-written sources. Prominent schools of historiography highlight and analyze the rich available evidence in competing as well as complementary ways. Over these many centuries, the diverse human communities of India (and later also Pakistan and Bangladesh) each developed distinctive cultural and material relationships to the changing world around them. I found some of the most revealing evidence for cultural attitudes in religious, literary, and state/governmental expressions about, and valuations of, the land, water, minerals, flora, and fauna around them. Further, as technologies to collect/extract and process these “resources” continued to develop, the relationships among these communities, states, and the “natural” world also shifted. For instance, regional states and empires, from the Indus civilization, through the Mauryas, the Mughals, and the British, and then the governments of independent India, Pakistan, and Bangladesh, each in its own way, identified and sought to control and alter the animate and inanimate resources under their power. Often local communities, especially forest dwellers and other marginalized groups, developed movements that incorporated non-violent or violent ideologies and methods to resist these state impositions. Further, these extended distinctive and recurring historical trends in environmental history also inform many of the Indian subcontinent’s intensifying environmental changes and official, NGO, and popular responses to them. Many of the people of South Asia are among those most vulnerable to the dire effects of climate change which has resulted far less from their actions than from those of the long-developed and long-polluting West. Nonetheless, South Asia’s relatively new nations, but ancient societies, are causing—and having to suffer the consequences of—severe degradation of their material, faunal, and floral environments. As developing economies, they feel that they need vast and increasing resources, and also scope to increase their carbon emissions. Yet, sea-level rise, increasing temperatures, and extreme weather events all will especially affect their 1.5 billion citizens. Only by engaging all parts of their diverse societies and incorporating their several cultural traditions can these nations adapt and become more resilient to today’s environmental changes and challenges.